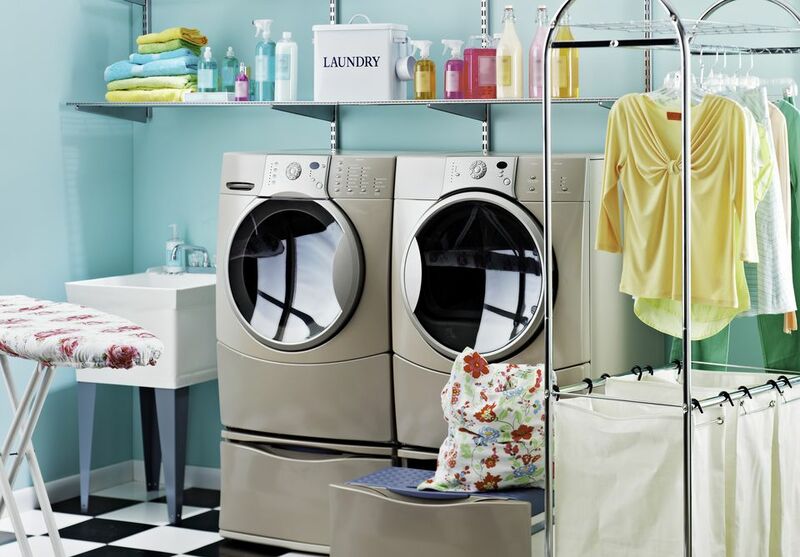 Most of us know the basics we need in the laundry room: washer, dryer, detergents, stain removers. Some even branch out and include more tools of the trade like sorting hampers, irons, ironing boards, and clothes steamers. But tucked away in the corners of the laundry aisles at your local store and online are some amazing gadgets that might just make your laundry day easier. Some are simple, some ingenious, most will make you ask, "Why didn't I think of that ?" Take a look at these 13 laundry gadgets you never knew you needed, until now! One of the most common complaints about front load washers is the odor that appears when bacteria grows inside the drum and behind the door seals due to soil and detergent residue and excessive moisture. In addition to regular cleaning, one way to reduce the odors of the mold and mildew is to leave the washer door open when not in use. But, that can be hard to do if the washer door blocks a passageway and then it ends up closed again. Now, there's the Laundry Lasso! The stretchable lasso has suction cups and military grade elastic cord that can be adjusted to keep the door ajar even when bumped but still keep it safely out of the way. When you're using the washer, the Laundry Lasso can easily be moved to the side but stays attached and handy. Hanging freshly washed or dried clothes can reduce wrinkles and eliminate the need for ironing. But, not everyone has the floor space for a drying rack or a spot for a permanent hanging rod. How about a wall mounted organizer that looks like a decorative element in the laundry room? The Arrow Hanger comes in several styles including one that can hold your favorite photos. The hangers can be installed in a very small wall space and feature a chromed steel hanging rod that can hold up to 50 pounds. When the hanging laundry is put away, the bar disappears when the hanger slides shut. Buying laundry detergent or fabric softener in large containers can save on the cost-of-use-per-load but those huge bottles are heavy and can be messy to use. Now there are Tidy-Cups. Just lay the bottle on its side on a shelf or on top of your front load washer and attach the Tidy-Cup. The little plastic shelf slips over the neck of the bottle and holds the detergent cup. No more mess! A tip to prevent the use of too much laundry detergent per load is to use a permanent marker to clearly mark a line on the detergent cup. You'll never waste money or leave excess detergent residue in your clothes again. An ironing board takes up lots of space in the laundry room and can be a hassle to set up and then take down every time you need to use it. But, there are times that clothes or linens need a bit of ironing to remove wrinkles and make them look crisp. So, whether you have a traditional ironing board or simply choose to iron without one, an ironing mat is a must-have for quick touch-ups. The insulated mat protects the surface of your table, countertop, or laundry appliance. After ironing, it can be folded or rolled up and tucked away until next time. Two socks enter the laundry room. Only one comes out. Ever wonder where that missing sock goes? Look behind your washer or dryer. Front-load washer and dryer pairs no longer have the control board mounted on top of the appliance. The flat surfaces look sleek and fit well under upper cabinets but they leave an unprotected edge that is perfect for a sock seeking an escape route. Enter the Haus Maus Laundry Guard. The guard is hinged and can be adapted to fit either one or two machines. It is easy to install and removable for easy cleaning. No more falling laundry or detergent bottles! Getting clothes on a hanger as soon as they come out of the dryer often eliminates the need to iron. But it is a hassle when the hangers are all tangled or you have to go hunt down the right ones. A clothes hanger organizer instantly solves those problems by providing an easy place to store and organize wire or plastic hangers. The organizer can be set on the top of the dryer or mounted to the inside of a cabinet or closet. If you just can't give up your ironing board but don't have space for a floor model, get one that mounts to the back of a door. This model is a steel-framed and has a steel ironing surface. While smaller than a standard ironing board, it is much larger than a tabletop model and more sturdy. The board fits over inside and outside doors and lowers with the touch of a lever and includes an ironing board cover. Sock clips serve two purposes. They keep socks together in the washer and dryer so one doesn't go astray and they eliminate the task of matching mates when folding laundry. You can find several types of clips from slip-on rings to plastic clips. Start by teaching your kids how to use the clips (make it a matching game) and then ask (bribe) them to use them every time they take off a pair of dirty socks. Keep some clips near the dirty clothes hamper and a collection jar near the sock drawer. These will change your laundry life. Laundry room leaks can be a small trickle from your washer or a flooding gush of water from a ruptured washer hose. Both need attention as soon as possible. But what if you don't notice or you're away from home? Water leak detectors can protect your home from very expensive damage and give you peace of mind. The detectors range from very inexpensive and low tech to sophisticated models that can send an alert to your cell phone. The less expensive models are powered by a replaceable battery and work by sounding a loud, audible alarm when moisture is detected. The more expensive models use wireless technology to send a notification to your smartphone when water is detected. That may not seem important for a small washer leak but a ruptured washer water hose can pump up to 650 gallons of water per hour into your laundry room destroying walls, floors, and surrounding areas. Many neighborhoods have banned outdoor clotheslines and most home laundry rooms simply don't have floor space for a drying rack. Why not choose a retractable clothesline as a handy, space-saving drying solution? Retractable clotheslines come in different styles and sizes with suitable mounting hardware for easy installation. Inside your laundry room are two huge metal appliances just waiting for magnets. Why not select one that is colorful and useful? A magnet that includes laundry tips will prove helpful in teaching kids and laundry novices how to handle stains and serves as a reminder to check and empty pockets and pretreat stains. An added tip if you don't want to purchase a magnet, erasable markers can be used on appliances to leave notes and reminders. "Don't put the red sweater in the dryer." "Need clean volleyball uniform for Tuesday." A key to smooth, crisp fabrics is a sturdy ironing board and a smooth, wrinkle-free ironing board cover. If you have trouble with the cover slipping, sliding, and bunching up, you need ironing board cover fasteners. These elastic bands clip onto the cover and adjust to keep it tight. A bonus, the straps can also be used to keep furniture slipcovers and tablecloths in place when you're not ironing! These aren't exactly a gadget but how could anyone pass up clothespin cabinet hardware for the laundry room? If you're going to spend time in the laundry room, why not have decor that makes you smile? These pieces are versatile and can be used as a drawer pull or cabinet knob. They are ceramic pieces with steel mounting barrels and hardware. Because each clothespin is hand sculpted and painted, the colors can be customized to match your laundry room decor. Where Should the Laundry Room Go in a Home?